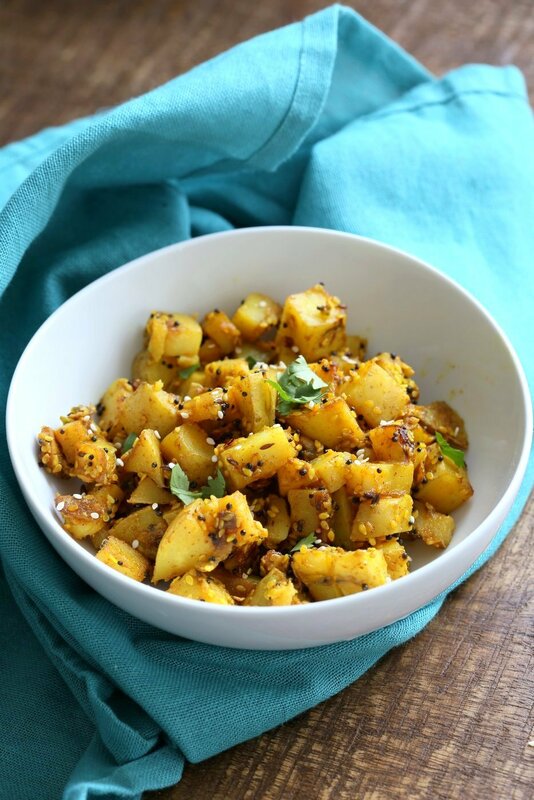 Gujarati Potatoes with Sesame Seeds. 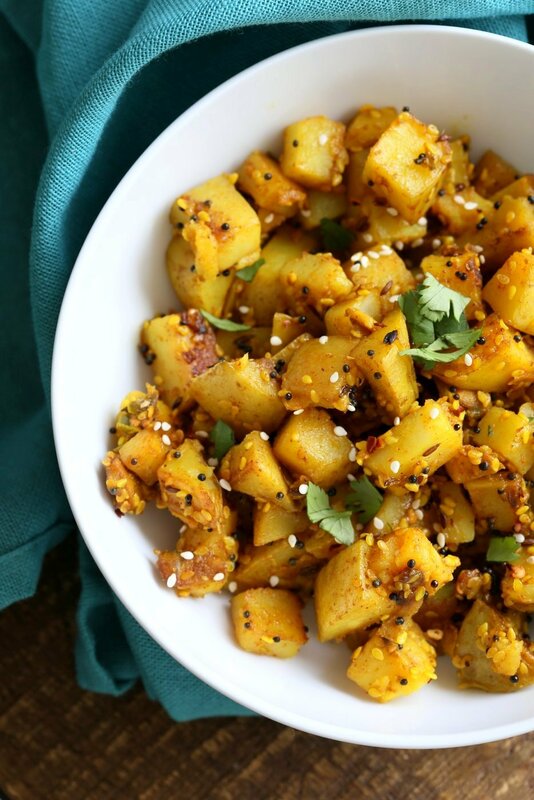 Indian Spiced Potatoes with sesame seeds and peanuts. Vegan Gluten-free Soy-free Indian Gujarati Recipe. Bateta Nu Shaak. Potatoes are made in various ways in many regional cuisines in India. Roasted with whole spices, roasted with garam masala, crisped up with rice flour, curried with tomato curry, paired with other vegetables and so on. There are also several family recipes with a twist that often become a favorite. These Gujarati potatoes are a variation of the dish one of my friends often had in her tiffin(lunch box) in middle school. Simply spiced with whole spices and finished with toasted sesame seeds or peanuts. This dry Bateta nu shaak is easy and flavorful. These potatoes make a great side or addition to an Indian meal. They also are a fun addition to wraps and sandwiches. 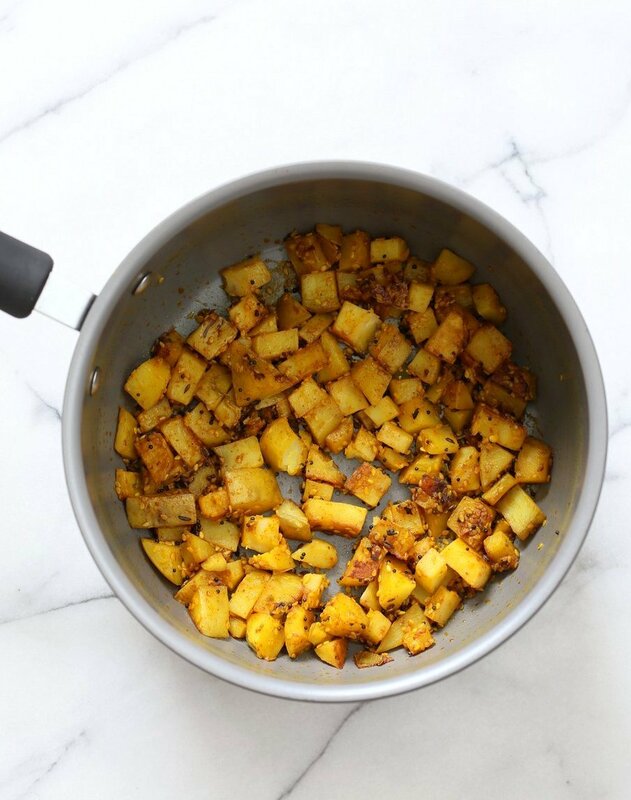 Make these spicy Indian Potatoes. 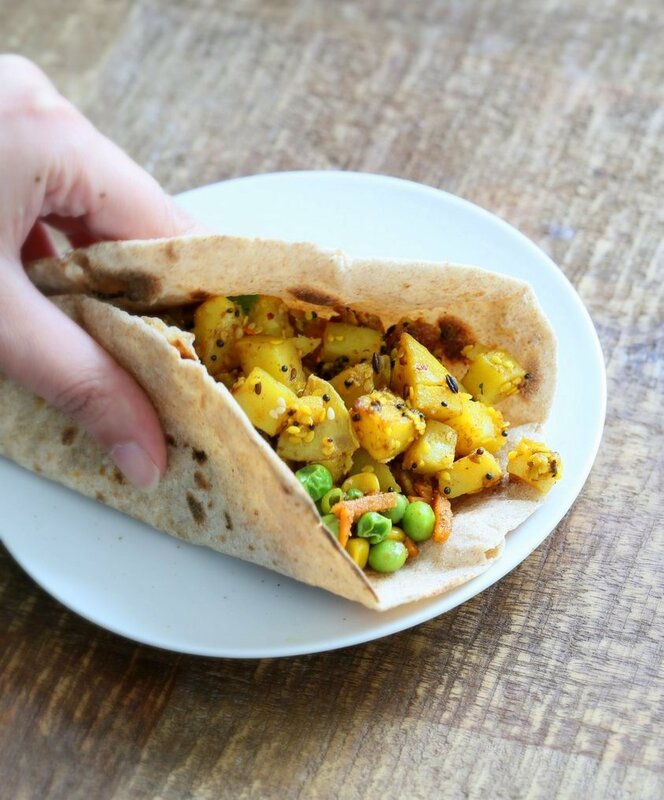 Serve as a side with Dals or Curries or make breakfast wraps with other roasted veggies/spiced chickpeas, crunchy greens and chutneys. Gujarat is a state in western India and has its own cuisine. The cuisine is known for simple flavors, celebrating vegetarian food, many interesting snacks (farsan), and some sweetness in savory dishes. Indian Spiced Mashed potatoes. So Good! If you make these potatoes, let me know how they turned out and how you served them! Summer heat has started claiming its casualties. The temperature inside a car even with windows cracked open can reach heatstroke temperature anywhere from 120 to 170 degrees within 15 minutes. Please leave the dogs at home. Dogs cannot sweat and cool down. Make these into wraps or add to a bowl. 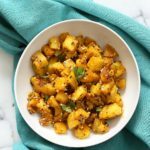 Gujarati Potatoes with Sesame Seeds. Indian Spiced Potatoes with sesame seed and peanuts. Vegan Gluten-free Soy-free Indian Gujarati Recipe. Bateta Nu Shaak. cilantro and lemon juice for garnish. Heat oil in a large skillet at medium heat. When the oil is hot, mustard and cumin seeds and let them sizzle for 30 seconds. Add sesame seeds and cook them for half a minute or until they start to change color. Add ginger, garlic, chile and cook for a minute. Add the ground spices and mix and cook for a minute. Add potatoes and salt and mix in. Cover and cook for 15 minutes. Stir once in between and add 1-2 Tbsp or so water to deglaze if needed. Reduce heat to medium low and cook for another 10 minutes or until potatoes are tender and cooked through and starting to crisp on the edges. Garnish with cilantro and lemon juice. Garnish with toasted sesame seeds or coconut or chopped roasted peanuts and serve as a part of a meal with Dals/Curries, or make wraps with spiced beans/chickpeas, greens and chutneys of choice. .
this sounds perfect. All these different spices and flavours… mmhhh… We still have a bit homemade peach ketchup in the fridge, so we think to eat your gujarati potatoes with a green salad and peach ketchup. What do you think, should we try it out? Yes please! I love fruit butters on savory! Sure, it should work. Let me know how they turned out! This looks delicious will try it on the weekend. A girlfriend has just recommended me to your site. I have made the tumeric carrot muffins and we had the vegan meatloaf last night and it was amazing. Love the spices you use. Your recipes have made the transition into vegan exciting. Awesome! so glad the muffins and loaf came out well! Not related, but happy you are posting recipes that work in the IP! Can I make this in the IP? You can possibly make them in the IP. Saute for the first step. Add potatoes, salt and cook for 2 mins, Add 1/4 cup water and cook for on manual for 5 minutes. Quick release after 10. The texture will be a bit different and the potatoes might tend to burn without enough moisture. Hi Richa love your recipes. Is 1 teaspoon of oil for 4 cups of potatoes enough to prevent it from sticking and burning? It depends on your pan. With a good non stick, it hardly needs any oil to avoid sticking. I see, Please can you tell me which pan you use, I am very concerned about toxins from Heflin and similar and haven’t found one which I am entirely happy with. This recipe looks delish! I think this would be great in the instant pot, I will test it out and see how it works. These look so amazing, can’t wait to make them and thanks including a message about dogs in cars in hot weather. People need to realise that hot cars are fatal for dogs. Not worth risking it! A wonderful recipe, which I made last night, as I happened to have all the ingredients. I wonder if it would work with curry leaves cooked into it? I might try it that way next time. This recipe is SO good. I’ve made it several times with various veg (including cauliflower and sweet potatoes and green beans) and it always turns out. Delicious. 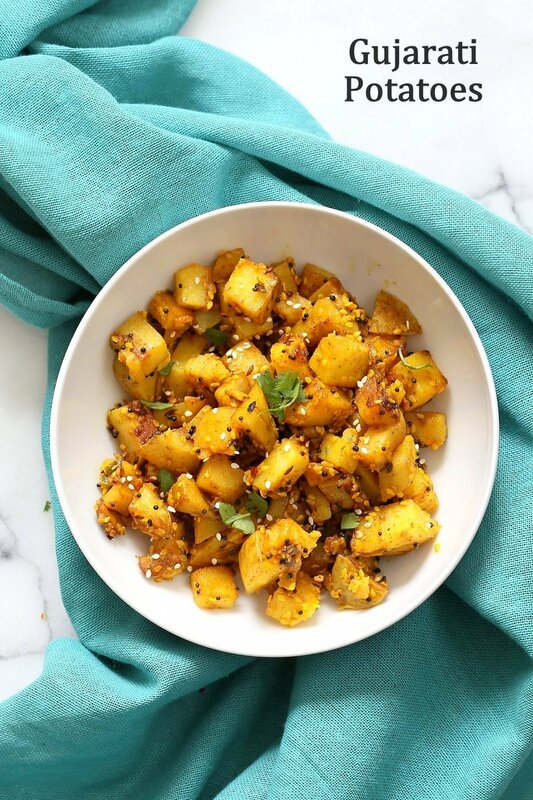 Hi Richa,i am a beginner of vegan food,i love to try this beautiful recipe and i already can imagine the smell and taste of this potato dish.Can i blend the ginger and garlic together? yes blend them to a paste and use. Incredible. This is so delicious! The only thing is I just ate it on its own since I hadn’t had time to make anything else to go along with it. So the taste is pretty strong. I added some cashews to tone it down a bit which worked pretty well, and for what’s left I might just cook some red lentils or make yogurt from silken tofu to mix in.